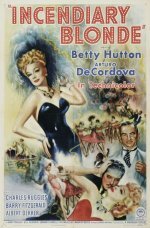 An explosive Technicolor musical biopic giving a somewhat selective account of the colourful life of Texas Guinan (Betty Hutton), infamous nightclub queen of the Prohibition era, whose famous catchprase was "Hello suckers!". As directed by George Marshall, and lavishly mounted by Paramount, the movie is lively and entertaining, jam-packed with songs, including It Had to Be You, and lots of incident involving bootlegging gangsters, one of whom (Arturo de Cordova) is Texas's lover. Betty Hutton's most significant role to date saw the star hurling herself at the material, both dramatic and musical, with the unsubtle force of a neutron bomb, leaving viewers either deafened and exhausted, or thoroughly exhilarated, depending on their taste.